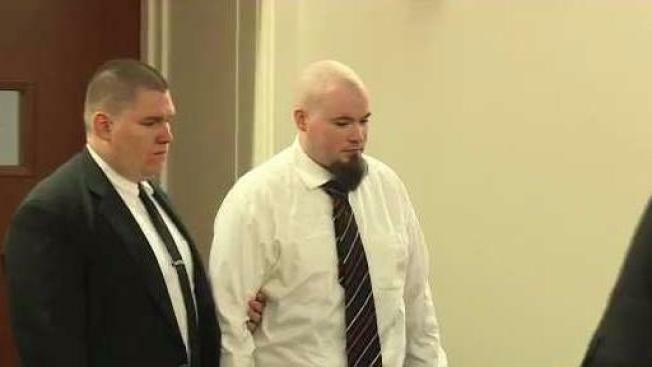 Leroy Smith III, who was charged with killing and dismembering his father in Maine in 2014, entered an insanity plea after being forcibly medicated and subsequently ruled competent to stand trial. A deal has been reached allowing a man who dismembered his father to avoid a criminal trial. Leroy Smith III, the first detainee to be forcibly medicated in Maine, entered a plea that he was not criminally responsible for his actions under an agreement between prosecutors and the defense. Smith will go to Riverview Psychiatric hospital immediately. The jury was dismissed Monday after the announcement in an Augusta courtroom. Smith was charged with killing his father in Gardiner, Maine. He told investigators he acted in self-defense because he believed his father was poisoning his food. Following the trial Monday, prosecutors said, "It's very clear Leroy Smith was legally insane at the time he killed his father." Smith was required to take medication under a 2015 law that aims to restore the mental capacity of defendants so they can participate in their own defense. Smith's defense attorney said, "[Smith] knows what he did. He honestly felt in his mind that if he did not kill his father, his father would kill him." The judge found Smith to be of sound mind to enter the plea.